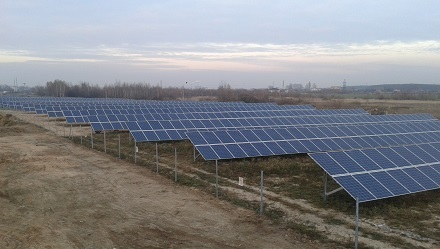 The second largest solar plant in Belarus is located in the village of Polykovichi in the Mogilev region. Its owner, sole proprietor Mr Zharinov, has been one of the active renewable energy developers in Belarus. Mr Zharinov applied for BelSEFF financing for the construction of an on-ground 1.7 MW solar photovoltaic unit. The BelSEFF team assessed the project idea, energy generation potential, technical-financial parameters, implementation schedule and risks of the project. The €2.2 million loan allowed the company to generate 1,600 MWh per year. All the produced electricity is supplied into the grid, thus the company benefits from the feed-in tariff for renewable energy. The investment will be repaid in slightly over six years. What is more important is that the investment creates an independent and renewable energy source for the region and the country, allowing diversification of the country’s energy balance and enhanced energy independence. In addition, the project allows a reduction of CO2 emissions by a substantial 770 tonnes of CO2 per year, making a valuable contribution to the mitigation of the negative effects of human activity on the climate. Renewable energy and solar energy in particular has become a trend in Belarus, with more and more companies investing in solar installations and selling energy into the grid. Although this sector is still at the initial development stage, the direction chosen is highly perspective. BelSEFF is present on the market to support with financing and advisory packages.